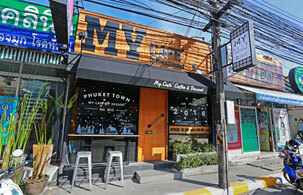 Looking for a place to enjoy a nice cup of coffee and desserts in Phuket Town? MyCafe'Phuket, the designed coffee cafe is your right choice... MyCafe'Phuket Coffee & Dessert is a chic cafe and restaurant in Phuket Town; a place where you can spend quality time with your friends. Bring new style of desserts which you can create and enjoy with, while the aroma of freshly brewed coffee making you feel more lively. All dishes are created by the owner and are presented in a modern and appetizing way.